For me, 2013 was the year of skincare. I completely overhauled my skincare routine and went from something very basic to something with a lot more products, which has been good for my skin but not so good for my purse! These have been my favourite skincare discoveries of 2013. I never thought that I'd use a face oil on my oily/combination skin, but the Antipodes Divine Face Oil (review) is probably my favourite skincare discovery of them all. The light, non-greasy oil contains lots of nourishing, natural ingredients, which makes my skin hydrated, re-balanced, super soft and is amazing for soothing angry spots and making the scars disappear much faster. 2013 was the year I discovered toner; both exfoliating and hydrating. 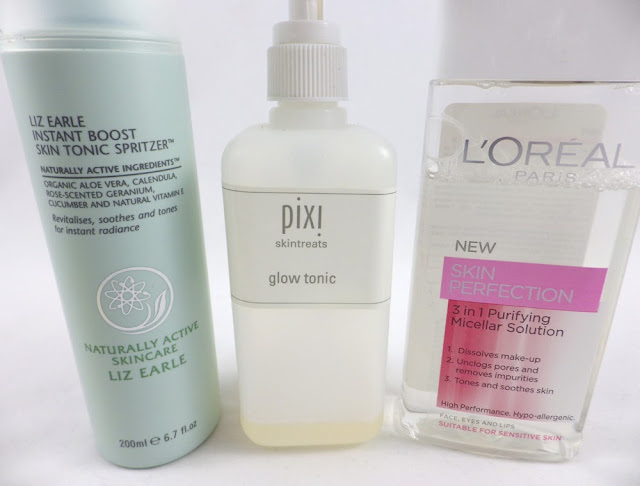 The exfoliating toner came in the form of the infamous Pixi Glow Tonic (review), which has replaced my need for a manual exfoliator. I apply it with a cotton pad twice a day and it not only works on any annoying dryness, but it has massively improved how often I get those big, cyst-like spots. My hydating toner is the Liz Earle Instant Boost Skin Tonic Spritzer (review). I spray it over my face after using the Pixi Glow Tonic and throughout the day as needed. It contains lots of naturally active ingredients and not a splash of alcohol, which hydrates and refreshes my skin. It also has a lovely subtle floral scent. I always carry a lip balm in my handbag and the best one ever has to be the sphere shaped EOS Lip Balm, which I have in Summer Fruit (review), Lemon Drop and Sweet Mint. They contain 95% organic and 100% natural ingredients such as Shea Butter, Jojoba Oil and Vitamin E. They smell/taste amazing and are really moisturising. Considering I started the year with no serums in my skincare collection, I now have about four or five. I chose the Elemental Herbology Cell Food Serum* (review) because its effect is so noticeable and quick. It is designed to boost radiance and vitality with plenty of active ingredients and anti-oxidants and it certainly makes my skin look brighter and more radiant - it's amazing! 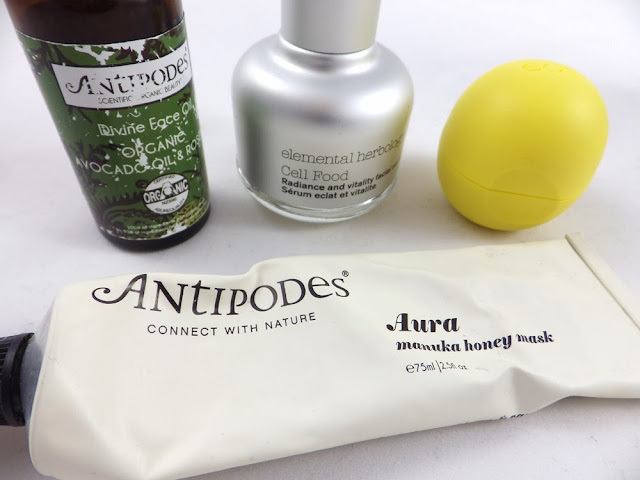 A product I've harped on about quite a bit on the blog and Twitter is the Antipodes Aura Manuka Honey Mask (review). I just love it. It has one of the best scents ever and not only is it intensely moisturising but the antibacterial manuka honey is brilliant on little blemishes and whiteheads. It's a fabulous multi-tasker and an alternative to using a clay mask and then a separate hydrating mask. Finally, it has to be the L'Oreal Skin Perfection 3 in 1 Purifying Micellar Solution (review). This is the first and only micellar water I've tried, but I am definitely a convert! It's so effective at removing makeup and and the gentle solution doesn't contain any alcohol or artifical fragrance, so it doesn't leave my skin dry or irritated afterwards. 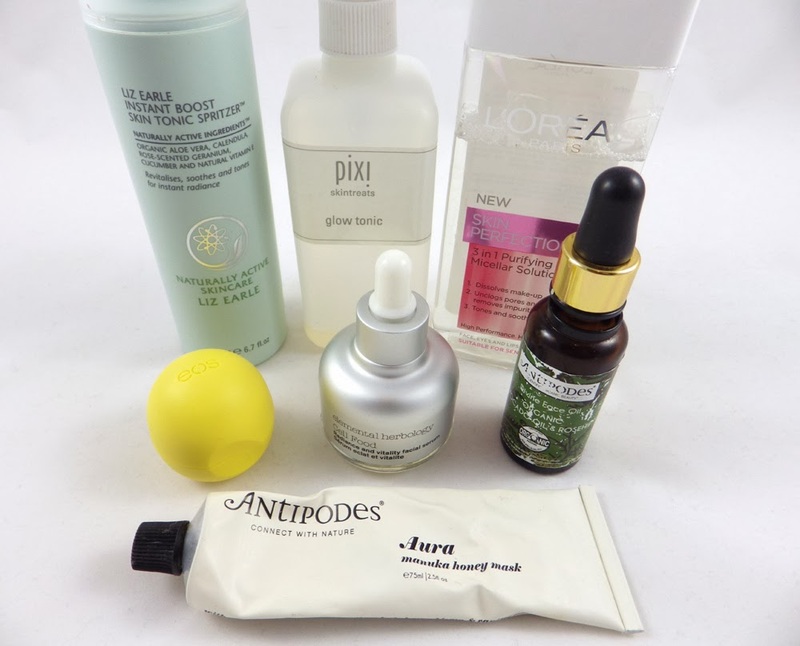 So these have been my favourite skincare discoveries of 2013! What have been your favourites? Are any of the above products on your list? *Items with a star indicate that they were originally given to me as a PR sample. Great post! I still need to get my hands on a EOS lip balm! I just read your Elemental Herbology Cell Food Serum review, it sounds uh-mazing but I have so many other serums I must use first. SOB. The L'oreal Micellar is one of my must have items from 2013! Tag: I'm a Beauty Blogger, Get Me Out of Here!